Columbus Neighborhoods hosts Charlene Brown and Javier Sanchez. 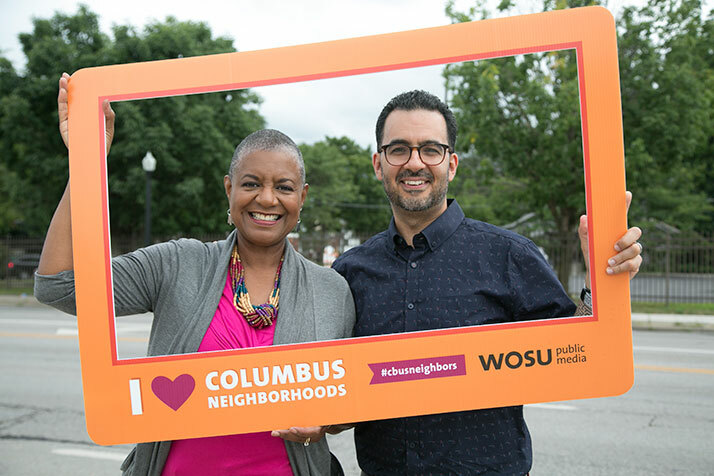 Columbus Neighborhoods, the Emmy® award-winning documentary series and community engagement project, will become a weekly television magazine show premiering Thursday, October 6 at 8:30pm on WOSU TV. Since the first program premiered in 2010, Columbus Neighborhoods has garnered recognition locally, regionally and nationally. Now, it will pivot from an occasional, in-depth historic documentary series to a weekly program that will explore life – then and now — in Columbus and Central Ohio. As with the documentary series, Columbus Neighborhoods will have a dynamic online presence at www.columbusneighborhoods.org, special public forums that will focus on key issues facing our community, and program segments and in-depth resources aligned to core academic content and adaptable across disciplines and educational levels. Recurring segments in the new series include “Driving with Jeff Darbee” where an architectural historian takes viewers on a personal tour of historic buildings; lunch conversations with show hosts Charlene Brown and Javier Sanchez who chat with civic leaders at locally-owned eateries; and “From the Vault” featuring hidden collections at Ohio History Connection. The audience can also get involved in the show by participating in the new initiative, “Curious Cbus”. Viewers and online users submit a question to wosu.org/curious, the question is voted on by the public, and if it is picked to pursue as a story, producers will work to find the answer resulting in a feature segment in the program. Watch a sneak peek at the new Columbus Neighborhoods. More behind-the-scenes details are also available at Columbus Neighborhoods website including web exclusives and segments not seen in the premiere episode. Major project support for Columbus Neighborhoods is provided by American Electric Power and State Auto Insurance Companies. Additional support for the weekly series comes from other corporate, private, and individual contributors.